Is your Poughkeepsie, New York home or business a flooded mess? Does your basement look more like the Hudson River than part of your home? We are the most qualified and experienced water extraction and flood restoration company serving Dutchess County, NY. We work efficiently and throughly until there is no water, humidity, or mold left in your home or business. 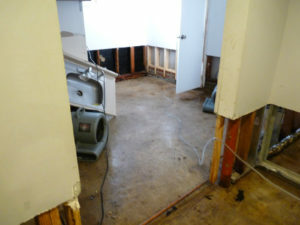 We provide completing rebuilding and restoration once the rooms are clear of water and mold. Your property will be back to its original quality and integrity once we are done. Floods, natural disasters and even broken water pipes can all lead to flooding and water damage. The longer you wait for flood restoration, the more time the water has to weaken the structure of your home and cause mold growth. Black mold can negatively impact the health of those in the vicinity. We provide mold remediation in Poughkeepsie and surrounding areas, to keep your home a safe place for your family. We are licensed to remove asbestos and lead-based paint that may be revealed with water damage, both of which can also be extremely hazardous to your health. You won’t have to worry about waiting for your insurance company . Insurance companies can be slow to respond to your calls, especially in the middle of the night. We respond immediately. Call us before you call your insurance company and we will get to your Poughkeepsie, NY expeditiously to get started on the water extraction and flood clean up. We will directly deal with your home insurance company for billing and paperwork.